The class Charophyceae, based on subcellular characteristics, is considered to be the closest extant group of organisms ancestral to all terrestrial and secondarily aquatic plants (embryophytes), and the link between the Chlorophyceae (green algae) and non-vascular Bryophytes (mosses). The group includes three orders, the Zygnematales (desmids), the Charales (Chara, Nitella), and the Coleochaetales (represented by Coleochaete, the most advanced of the group, genetically closest to ancestral land plants -- liverworts, hornworts, and mosses) (Graham and Wilcox 2000). Mitotic phenomena differ from those of the Chlorophyceae, and are more similar to those of ‘higher plants’. The terms ‘phycoplast’ is now considered ancestral and characteristic of the Chlorophyceae and ‘phragmoplast’ descendant and characteristic of the Charophyceae..The main difference between a phycoplast and phragmoplast is orientation of microtubules relative to the plane of cell division - parallel to the plane of cleavage in the phycoplast and perpendicular in the phragmoplast (Gaffal and el-Gammal, 1990; Johnson and Porter, 1968). Also the interzonal microtubules are not persistent during mitosis in the Chlorophyceae (they collapse), while they remain intact throughout nuclear division in the Charophyceae and higher plants (Stewart and Mattox 1975). Other differences that set the Charophyceae apart, summarized by Stewart and Mattox (1975) include structure of the zoopores (if produced) and enzyme involved with glycolate metabolism. Zoospores in the ancestral Chlorophyceae are apically inserted and their flagellar basal bodies have four bands or microtubules. Those in the descendant Charophyceae are inserted slightly laterally and their flagellar basal bodies have a single microtubule band. 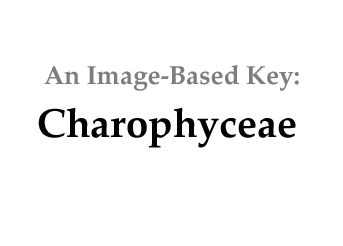 Most Chlorophyceans utilize glycolate dehydrogenase, while Charophyceae and all true plants use glycolate oxidase. Embryology: Shared with all terrestrial plants is retention of the embryo by the parent organism. The Zygnematales provide no covering of somatic cells around either the ovule or the embryo. Coleochaete covers the embryo (but not around the ovule until it is fertilized). Charales and all terrestrial plants cover both the ovule (before fertilization) and the embryo and are sometimes called the "embryophytes". Growth hormone: Ethylene is produced in the charophyte Spirogyra and probably other genera. Cell elongation is induced by addition of ethylene and is homologous with the cell elongation in the presence of ethylene in ‘higher plants’ (Ju et al. 2015). Gaffal, K. P. and el-Gammal, S. (1990). Elucidation of the enigma of the “metaphase band” of Chlamydomonas reinhardtii. Protoplasma 156, 139-148. Stewart, K.D. and K.R. Mattox 1975. Comparative cytology, evolution and classification of the green algae with some consideration of the origin of other organisms with chlorophyll A and B. Botanical Review 41(1):104-135.